Today Luke announced the winner of the #RealTinka project! Make a lifesize version of your Tinka. 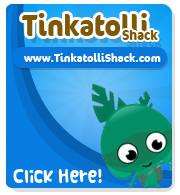 Tinkas are around 7-9 centimeters tall. But any size you feel comfortable with will do. Draw it on cardboard if you like! Upload it to the Tinka Fair. Add “RealTinka” to the name of your project! DEADLINE: NOON (TinkaTime) WEDNESDAY JUNE 13! A lot of you uploaded some very fine pics – like TheYAS’ and Sandano’s, pictured above! Check out the Craft section in the Tinka Fair!